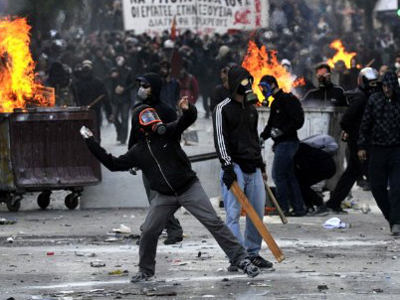 The Greek turmoil has taken over the G20 summit in Cannes, France. Observers have only been able to guess just what it was that Angela Merkel and Nicolas Sarkozy said to the Greek Prime Minister that caused his backtrack on referendum plans. Wrapping up the summit of the world’s major economies, French President Nicolas Sarkozy expressed hope that the EU could impose a financial transaction tax (FTT) as soon as next year. No agreement has been reached, but the European Union is still strongly behind the move, he said. The idea to install what the Occupy Wall Street demonstrators called the Robin Hood tax was taken to the G20 by Microsoft chairman Bill Gates. The French leader also warned that 11 tax havens, or indeed any countries which do not share tax information, would be shunned by the international community. "We don't want any more tax havens. Our message is clear," declared Sarkozy, pointing out Switzerland and Liechtenstein as not doing enough to end bank secrecy. Greece’s difficulties have taken over the entire summit, with other issues being pushed aside. The latest news of the summit is Greek Prime Minister’s backtracking on the national referendum on the EU bailout package. 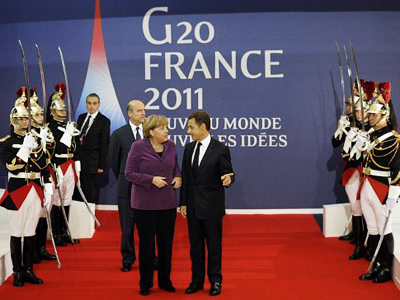 The EU leaders, especially those of France and Germany, were very satisfied with this decision of the Greek leadership. ­The Financial Stability Board, which monitors the global financial system, has come up with a list of the world's biggest banks, which are required to meet additional capital rules. The banks are regarded as too big to fail, so to the whole global economy would be put at risk if the situation of 2008-2009 financial crisis recurs. The list includes 29 banks, with the Bank of America, Bank of China, Barclays, BNP Paribas, Citigroup, Deutsche Bank, Dexia, Goldman Sachs, JP Morgan Chase, Mitsubishi UFJ FG, Societe Generale and Unicredit Group among them. British Prime Minister David Cameron has applied fresh pressure on Greece to make up its mind about whether it wants to stay in the eurozone. "The Greeks have to decide, do they want to stay in the eurozone, accept the debt reduction package that was negotiated and make that work for them within the eurozone – or do they want to take another path?" Cameron said. "What they can't do, I think, is just string this out endlessly with another round of conversations, discussions and negotiations," he added. Some critics say that France and Germany have basically said to Athens: “You either play by our rules or get out.” Eventually, Greece has decided it does not want to leave the eurozone. Euroskeptics are saying that the problem is simply being moved down the road, and Greece will finally have to default anyway. Eurocrats respond that this is the only way to save the euro – “the beating heart of Europe” according to Nicolas Sarkozy. The topic is expected to dominate the second and final day of the summit. Meanwhile, emerging economies from the BRICS group are doing their best to make their voices heard. 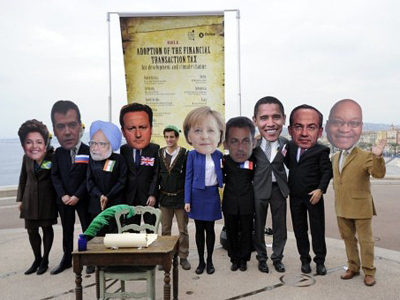 Their leaders say they would try to help the eurozone and inject their own money. They have not agreed on the final sum, though. At the same time, the BRICS countries announced a condition for their help. According to Russian President Dmitry Medvedev, it is not a hidden agenda, and BRICS countries want their voices to be heard: they want more say in the IMF and other financial institutions. ­G20 leaders have failed to agree on the ramping up the firepower of the International Monetary Fund, with the US insisting that the eurozone countries should sort themselves out. Still the general agreement that the fund’s resources should be boosted secured the issue a further detailed discussion by the finance ministers. "We have… different options and I mentioned them in my introduction. We asked at the G20 level that the ministers of finance of the G20 work on the establishment on those three options," said Herman Van Rompuy, who chairs the European Council. "One of the options is to set up, you can call it some kind of trust fund, enhancing the resources of the IMF. So this is not only meant for the eurozone, it is meant for the global community," he added. A G20 source said that no figures were provided the expansion of the IMF is seen in the range of $300-350, mostly coming from emerging countries such as China, Brazil or South Africa, reports Reuters. Now this is up to these countries whether they want to invest into the IMF, which at that point of time ultimately means offering credit to a faltering eurozone. ­Under significant pressure from European authorities as well as financial institutions, the Italian government has agreed to accept the International Monetary Fund and the European Union monitor its progress with economic reforms, Reuters reports. Italian Prime Minister Silvio Berlusconi’s long-delayed reforms include changes in the pension system, labor markets and privatization steps. "We need to make sure there is credibility with Italy's targets – that it is going to meet them,” and unnamed EU source was quoted by Reuters as saying. “We decided to have the IMF involved on the monitoring, using their own methodology, and the Italians say they can live with that." Rome will comply in response to increased pressure is an apparent attempt to support the country’s position on bond markets. The country’s borrowing costs grew above 6 per cent this week, and this fact did not add to the overall confidence in Italy’s ability to cope in the long-term perspective with its debt of 120 per cent of GDP. PM Berlusconi has confirmed that Italy has asked the IMF to monitor the reforms implementation, but he has rejected any further financial aid from the fund, reports the Associated Press. 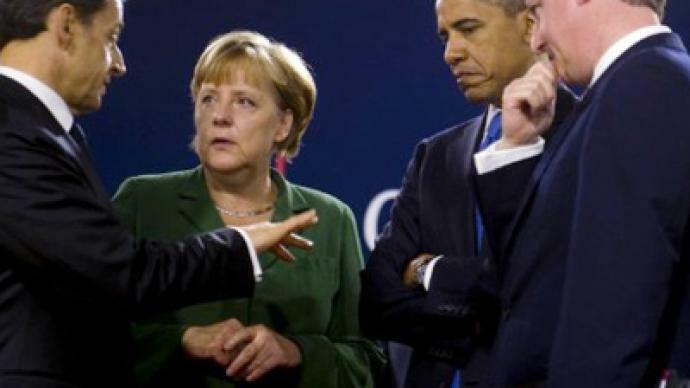 The consent by the Italian leadership followed Greece’s withdrawal from the initial plan to hold a referendum on the EU bailout package, and was agreed on during late-night talks with the eurozone leaders and US President Barack Obama on the sidelines of the G20 summit. Gerald Celente, director of the US-based Trends Research Center, told RT that EU leaders are simply using Greece as a scapegoat for their own, bigger mistakes. “The whole European Union is in great danger,” he said. “Listen to the words of Silvio Berlusconi that he said on Saturday that were hardly repeated. He said it was a strange currency that has not convinced anyone. And then, of course, he backtracked right away. 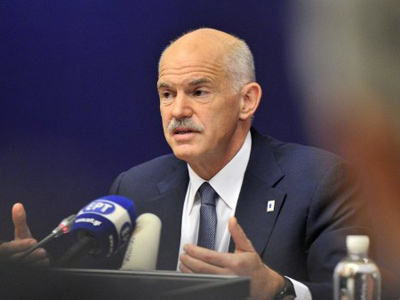 “They are using Greece as the excuse for the whole failure. It is one of the smallest countries in the EU! Italy compared to it is in much greater danger with a much worse GDP; and you have Ireland, you have Spain,” Celente concluded.